Kaelin and Justin choke back tears when they first spot each other. Stephanie and Kenneth let their bridal party join in on the first look. Jade covers his eyes to add even more anticipation before the big reveal. The bridesmaids sneak peeks from below. Rachel and Conan share one last hug before seeing each other. Conan fights back tears as he sees how radiant Rachel looks. Kyle’s jaw drops when he sees Kate. Mike looks elated upon seeing Danaea walking down the street. Kyle nervously waits behind a door for Danielle. The couple shares a quiet moment before turning around. Sheer joy crosses both of their faces upon seeing each other. Jason can’t believe his eyes when he spots Lauren. He’s so wowed that he takes a lap around Lauren to check out her gorgeous gown. Mike gets a little giddy as Sara approaches. A huge grin crosses Brett's face when he turns around. And then the tears start streaming! Brett’s emotional reaction takes Renee by surprise. Doug feels like the happiest man in the world upon seeing Rosa. Amanda and Brett didn’t plan on having a “first look” moment. After getting ready in separate rooms, he knocked on her door to ask a question. When she opened it, his jaw dropped! Moe can’t control his massive smile when he sees Jen. Chip’s face lights up when his beautiful bride approaches. Janelle isn’t afraid to show how thrilled she is to be marrying Dennis. After checking out her beautiful dress, the couple shares a warm embrace. 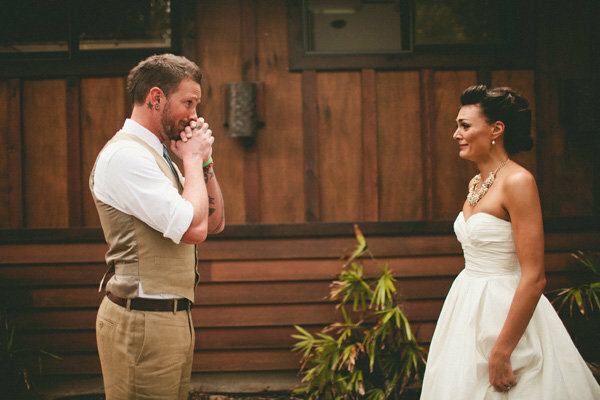 Even a tough former football player like Eric Barton can get a little teary-eyed on his wedding day. Both Jody and Shannon are overcome by emotions. Jelani’s awestruck expression makes our hearts melt. Adam dissolves into happy tears when he sees Laura. Jess anxiously awaits Preston’s arrival. This couple can’t stop smiling as the anticipation builds. Katherine plans a sneak attack on Ted. Ted’s jaw drops when he spots Katherine. Lisa makes a grand entrance down the venue’s cascading staircase. The bridal party shares in the couple’s enthusiasm. Cory can’t wait to see his beautiful bride. Pure joy crosses Felipe’s face when he turns around. Sarah and Evan both stop in their tracks upon spotting each other, savoring the moment. Sarah gives Evan a peek at her hot pink shoes. Stephanie and Michael choke back tears as they share a sweet moment. A first look doesn't need to be overly emotional to be memorable. Jenny and Daniel join together for a quick toast before the ceremony.